Fall is a special time of year. Leaves slowly turn a different color. Daylight savings time gives us all a reason to fall back. And there are movies. Great, glorious, marvelously crafted movies! With the help of L.A. Weekly, we're breaking down exactly what you'll want to see and what you might not want to waste your time on over these last four months of 2017. Between IT and Star Wars: The Last Jedi, we're getting a lot of crazy, cool cinematic excursions, some Oscar hopefuls and others not so much. But whatever it might be, we're sure there is an audience out there for it somewhere. Many people wait for this time of year. They spend the majority of their time watching all the hot new TV shows. But there will still be a reason to get out of the house on the weekends. As Hollywood is making one last chance play to make this year something special. Soon, all of the 'really good' movies of the year will be bombarding the multiplex. Not that there weren't some surprises this summer. There were, but not many. Now, we enter what is known as award season. A time when most movies will be battling for Academy Award supremacy! And that is only good news for us many film fans. Though, on that note...Not all of the movies coming between September and December will catch the Academy's eye. Conversely, the movies that don't make Oscar's special ballot aren't all bad. The best movies seem to fall somewhere in the middle, and are usually recognized for being honest. However, what usually seems to be the case is that the highest grossing film of any year is usually not the film that wins the Academy award. And this year, there is no doubt that The Last Jedi will be that movie. So, while we wait for Luke Skywalker to arrive and bolster what has been a sagging year at the box office, sit back and enjoy our 2017 fall movie preview. There really is something for everyone on this list. And the best part? Chances are that the majority of the films here are going to be better than anything else you've seen so far this year. There are some truly great fall movies coming our way soon. And this is proof. The evil, shape shifting clown Pennywise is back in what many think might be the best film version of Stephen King's classic novel. With a cast that features, among others, Finn Wolfhard from Stranger Things, IT really looks to be stacking the deck for this horror fest. At a time when people seem to want nostalgia heaped upon them, IT is the perfect fall film to remind us to look ahead to the future. Reese Witherspoon plays a single mother living in Los Angeles. Her life and the life of her kids are all upended when three young men move in with them. Alright, probably not the most anticipated film of 2017, but it is great to see Reese back in the genre sandbox she plays so well in. Could this be the surprise hit of the 2017 fall movie season? Dylan O'Brien plays Mitch Rapp, a man whose personal tragedy drives him into a black ops unit headed by Michael Keaton. Eventually, they find themselves in the hunt for an operative in the Middle East who is bent on starting World War III. The trailers for this action/thriller are quite well done. So much so that even though it seems like we have seen this film before, we realize we haven't really seen this story. Ever. Darren Aronofsky is back with what, by all accounts, looks like a horror movie starring Jennifer Lawrence. Oh yeah, and Javier Bardem is involved. The film looks at a couple whose relationship is pushed to the brink when some guests arrive that aren't guests at all. Could the Academy be giving awards out to a horror film in 2018? Find out this fall. Jake Gyllenhaal really seems intent on pushing himself to the absolute limit doesn't he? You could look at roles in Nightcrawler or Southpaw and the guy's acting cred card would be punched for his entire career. However, in this biopic, Gyllenhaal plays a man who was severely wounded in the 2013 Boston Marathon bombing. If this idea doesn't grab you, you may just want to watch Barney videos for the rest of your life! Inspired true events, Jeff Bauman is an ordinary man who captured the hearts of his city as a 27-year-old, working-class Boston man who was at the marathon to try and win back his ex-girlfriend Erin (Tatiana Maslany). While waiting for her at the finish line, he lost both his legs in the blast. Regaining consciousness in the hospital, Jeff is able to help law enforcement identify one of the bombers. But the story goes even deeper, as he tackles months of physical and emotional rehabilitation with the unwavering support of Erin and his family. Filled with raw emotion, humanity and humor, Stronger is the inspirational real-life story of the man who became the living embodiment of Boston Strong. And we're sure the drama is on it's way to securing some big Oscar nomination this fall. With a President in office who was caught on video saying "locker room" talk, a film like Battle of the Sexes has never been more poignant. This story follow the real life tennis match between Bobby Riggs (Steve Carell) and Billie Jean King (Emma Stone) that took place in 1973. While there was a TV movie about this very subject starring Ron Silver as Riggs and Holly Hunter as King, it is nice to see this tale getting the big screen treatment that it deserves. Young ninjas Lloyd, Jay, Kai, Cole, Zane and Nya have to defend their home of Ninjago in this newest offering from Warner Bros. Okay, these LEGO movies are a lot of fun and The LEGO Ninjago Movie should be no different. With comedy that plays to both adults and kids, the fall fun seems poised to continue well passed September. After losing their base of operations the Kingsman become modern day nomads. This pursuit leads them to a super secretive US spy organization called the Statesman. Suddenly, these two forces discover that they need to work together as there is a force much bigger than them. And it wants to destroy the world! Taron Egerton and Colin Firth return for this second go round as Eggsy and Harry Hart. This fall we are in, in, IN! Medical students obsessed with the afterlife kill themselves to see if there really is one. A redone version of the 1990 hit, Flatliners even sports Kiefer Sutherland who appeared in the original film. The first movie was a classic that tackled questions of ethics, morality and faith. Lets hope this new version attempts to go half as deep! Doug Liman directs Tom Cruise in the this true tale of 1980s drug dealing. Cruise plays Barry Seal. He is a pilot who carts drugs back and forth to the US. Cruise and Liman teamed up for the very well received Edge of Tomorrow. Cruise has seemingly done his cinematic repentance after falling from grace for whatever he fell from grace for. Thus, the time is right and American Made is easily going to be one of the most entertaining films of this fall movie season. Officer K (Ryan Gosling) finds himself on a mission. He's just discovered a secret that could effect mankind and he needs officer Rick Deckard (Harrison Ford) to help him piece everything together. The problem is that Deckard has been MIA for 30 years. This is the first Blade Runner film in 35 years! And Harrison Ford is back playing his iconic character!! We were in before we even saw a frame of film. Having seen some trailers of this super secretive production, October 6 can't get here soon enough. Idris Elba and Kate Winslet star in this action adventure that plays like Alive meets Titanic. Our two main characters are stranded after a plane crash. If this wasn't bad enough they are on a snow covered mountain with zero chance of getting help. So... they've got to band together to survive the icy elements and animals that surround them. A truly great pairing in a truly tremendous situation. This sounds like an awesome film in ANY season. This film gives us a look at A.A. Milne, the person who created the beloved character of Winnie the Pooh. Making this story even more special is the fact that Milne based that character on his son. With a cast that includes Margot Robbie, Domhall Gleeson and Kelly Macdonald, it will surprise nobody when this thing gets many mentions come Oscar time. A true fall film if ever there was one. Chadwick Boseman plays a young Thurgood Marshall trying one of his first cases. Marshall would then go on to make history as the first African-American Supreme Court Justice. So compelling is Boseman on screen that Marshall separates itself from the fall movie pack. It is easy to see this film as a tale that is pure Oscar bait, but stories like this need to be told and director Reginald Hudlin is just the man for the job. Michael Fassbender plays Harry Hole. He is a detective trying to find a woman who has disappeared. What seems like a silly premise for a horror movie, appears to actually play like The Silence of the Lambs. So filled with horror movie fury is the trailer that The Snowman seems poised to quite possibly be the most talked about movie this fall! Gerard Butler, Ed Harris and Andy Garcia star in a film about satellites reigning holy hell upon the earth where they were created... count us way IN. Directed by the always certifiable Dean Devlin, Geostorm is already the Gone With the Wind of the disaster film set. Fall movies just got a lot more fun! Miles Teller heads a solid cast in this film about a group of soldiers returning home from war ravaged Iraq. We get a first hand account of just how hard it is for them to re-enter civilian life. Miles Teller is one of the most intense actors working today, and Thank You for Your Service seems intent on building upon that this fall movie season. In what looks to be the funnest Thor film of the bunch, Thor: Ragnarok sees our hero imprisoned and in a battle with the Hulk! Add to this that the very evil Hela is also trying abolish Asgardian civilization, and it's no wonder that our blonde haired hero is feeling a bit of time crunch. Everything about Thor: Ragnarok feels fun. 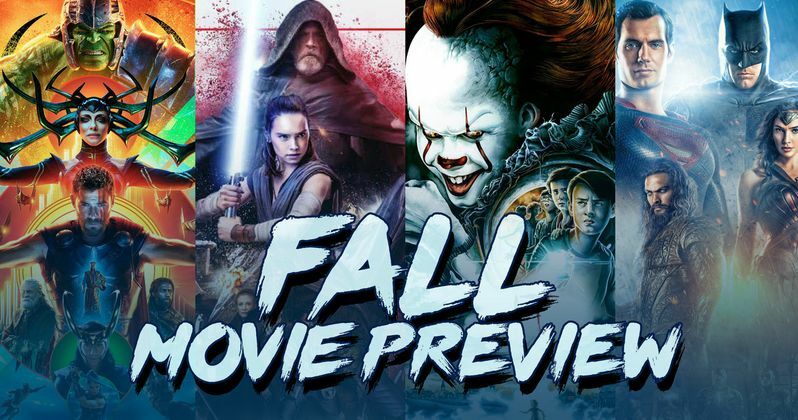 From the 1980s sounding soundtrack, to the over the top special effects, to the Hulk talking, it all adds up to a great time at the movies this fall. George Clooney's newest movie looks like a Coen Bros. film and it makes sense... because Suburbicon was actually written by them. With a cast that includes Matt Damon, Oscar Isaac, and Julianne Moore, it would be a complete shock to everyone if this film wasn't the darling of some awards event. This tale of a small town being shaken by a home invasion, seems to slyly look at this country's turn to xenophobia in recent times. What a fall film indeed! Taking a page from the Daddy's Home 2 playbook (or, maybe Daddy's Home 2 took a page from A Bad Mom's Christmas), Amy, Carla and Kiki struggle with their moms when they come to visit them. With comedy that is both subversive and re-inventing the wheel, A Bad Mom's Christmas can't be anything but hilarious this fall... can it? Agatha Christie's classic tale gets a classic cast in this nail biter of a mystery. Master sleuth Hercule Poirot (Kenneth Branagh) attempts to find a murderer aboard a lavish train. Okay, you've got Branagh, Johnny Depp, Michelle Pfeiffer, Daisy Ridley, and Willem Dafoe just to name a few thespians in this film. Branagh is also directing. The millennial set may not but stoked for this fall film but we sure are! A psychotic looking Mel Gibson seems to be the scene stealer in this follow up to the 2015 hit Daddy's Home. Daddy's Home 2 sees Brad (Will Ferrell) and Dusty (Mark Wahlberg) join forces when they have to deal with their overbearing fathers played by Gibson and John Lithgow. With comedy that seems like it goes into Blue Velvet territory, Daddy's Home 2 might be the most subversive comedy since Bad Santa. Bruce Wayne aka Batman joins forces with Wonder Woman, Aquaman, Cyborg and The Flash to stop the world from being destroyed. There is much that could be said about Justice League as so many of DC's offerings have been problem children. However, Wonder Woman seems to have turned things around, and there is a lot of good will surrounding this epic tale. Here's hoping Justice League brings the superhero film to new heights this fall movie season! Wonder sees Jacob Tremblay in a command performance as Auggie Pullman. He is a boy with facial differences who has never been in a mainstream school environment. Now in the fifth grade, Auggie makes the leap into the world and what follows is an inspirational story for all time. With a cast that includes Julia Roberts, Owen Wilson and Mandy Patinkin, Wonder is just the fall tale we need in these cynical times. After a man (Bruce Willis) has his family life crushed by a heinous act, he takes up arms and plans to wipe out the very people responsible. With Eli Roth directing, this film (which also stars Vincent D'Onofrio), seems to have everything going for it. In a time when so many things seem uncertain, Death Wish is a movie you can bank on. The vision of Guillermo del Toro takes shape in this bleak, fantasy thriller. Set in 1963, Elisa (Sally Hawkins) is living a life of loneliness. Things change when she and Zelda (Octavia Spencer) happen upon a government experiment that is highly top secret. Guillermo del Toro is the master of the dark world and this fall that appears to be totally on display in The Shape of Water. The Room is a cult classic from 2003. People watch the film and interact with it as it plays. It is a very much The Rocky Horror Picture Show in more modern times. Like many films, the person behind the film, and the story of the film's creation is actually more interesting than the film itself. James Franco plays the film's director Tommy Wiseau and it seems like The Disaster Artist might become a cult comedy of its own! Rey continues to battle the Darkside with a little help from Finn, Poe, and a dude named Luke Skywalker. I could tell you more but chances are you know more than I do. Easily, one of the top 3 most anticipated films of this fall movie season! Four high schoolers get sucked into the world of a video game and realize they have to survive it or risk never returning. The Rock and Kevin Hart team up, yet again, and this time they have Jack Black to hang out with. Jumanji: Welcome to the Jungle is the kind of adventure that should keep kids and parents glued to their movie seats this fall. A mix of action and adventure, this film might just be the funnest movie to close out 2017. Matt Damon, Kirsten Wiig, and Christoph Waltz star in this satirical film about a man who decides life would be better if he was smaller. Alright, we're not sure how this whole thing plays out but if anybody can make it incredible it's Oscar darling Alexander Payne (Sideways). This fall lets get small! Thomas Edison (Benedict Cumberbatch) goes head to head with George Westinghouse (Michael Shannon) as they try and bring electricity to the American people. The Current War seems like the kind of film that can even make electricity interesting. With a cast that is sure to nab at least a few mentions of Oscar gold, look for The Current War to be one of the most talked about films this fall movie season. The Bellas reunite for a singing competition overseas. Little do they know that the team they are going up against uses their voices AND instruments. Okay, lets be honest, we all know that Pitch Perfect 3 is going to follow the same formula as the other two films. What we don't know is how they are going to overcome all of their obstacles, and what kind of quick witted sassy situations they going to get in along the way.